A hickey is a small spot or imperfection that appears in print on images or flat tints. It is sometimes called a bulls eye or fish eye. The problem is most visible in areas of heavy ink coverage. Void hickeys are blank, unprinted spots in a printed area. Doughnut hickeys are solid printed areas surrounded by a circular unprinted area. Doughnut hickeys produced by particles of ink skin collecting on the blanket or plate are called ink hickeys. Hickeys are caused by dirt, paper fibers or hardened specks of ink on the printing plate or blanket. On offset presses the addition of a special roller, called a hickey-picking roller, can minimize the effects of hickeys. The example below is taken from a magazine article. 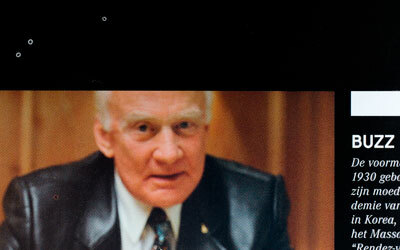 Notice the fourth hickey in Buzz Aldrin’s jacket.